My love of anything lemon flavored applies to entrees as well as desserts. One of my favorite dinner choices is chicken piccata. 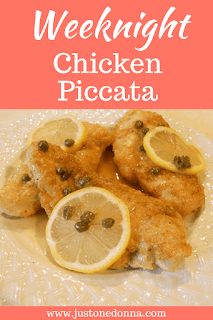 Chicken piccata is a winner in my book because it has both lemon and capers. This Weeknight Chicken Piccata is a recipe I have made for years and years for my family. I call it Weeknight Chicken Piccata because it is very quick and easy. It's simple and delicious meals like this that can make your weeknight dinners special. You can come home after a long day of work and have this yummy dinner on the table in 30 minutes. I kid you not! You'll feel like you are treating yourself with this meal after a long day at work. It is delightful to look at and just as delightful to eat. Bouillon cubes add chicken flavor and saltiness to the sauce. It pretty much makes this meal a no-brainer which is another reason it works as a quick weeknight dinner. Capers also add a little taste of briny saltiness to the sauce, which I love. For these reasons, go easy on the added salt. As always, taste the dish several times to be sure you are getting the level of seasoning you want. I always add a little more capers than the recipe suggests because I love capers. The more, the better! The choice is yours. This is a great recipe for you to use chicken breasts you de-boned yourself to save some money. Yes, you can do this yourself. Check out my video to see how easy it is to de-bone chicken breasts. Mix the flour, garlic powder, and paprika together on a plate. Mix the egg with 1 teaspoon of water and a pinch of salt and pepper and pour into a shallow baking dish. Dip the chicken breasts first into the egg and then dredge in the flour mixture. Coat each piece of chicken very lightly with the flour mixture. Heat the butter and olive oil together in a frying pan over medium heat. Mix the bouillon cubes with the boiling water and set aside. You could substitute chicken broth, but the bouillon mixture has more intense flavor. Saute the breasts in the butter and oil for approximately 3 minutes, or until lightly browned. Turn each piece and brown the other side for approximately 2 minutes. Pour the bouillon mixture and lemon juice over the chicken breasts. Add the capers and stir to combine. Cover the pan and simmer for 10-15 minutes. Remove the chicken breasts to your serving plate. Pour the sauce over the chicken breasts and garnish with lemon slices. Serve with pasta or rice and the vegetable of your choice. Check out this Mediterranean Chicken Skillet Dinner.